The power of the emperor varied between emperors and dynasties, with some emperors being absolute rulers and others being figureheads with actual power lying in the hands of court factions, eunuchs, the bureaucracy or noble families. In principle, the title of emperor was transmitted from father to son via primogeniture, as endorsed by Confucianism. However, there are many exceptions to this rule. For example, because the Emperor usually had many concubines, the first born of the empress (i.e. the chief consort) is usually the heir apparent. However, Emperors could elevate another more favoured child or the child of a favourite concubine to the status of Crown Prince. Disputes over succession occurred regularly and have led to a number of civil wars. In the Qing dynasty, primogeniture was abandoned altogether, with the designated heir kept secret until after the Emperor's death. Of the San Huang Wu Di, the three first of them were called 皇 (huang, "god-king") and the five last were called 帝 (di, "sage-king"), which can translate as either emperor, demigod human, or a superhuman. This title may have been used in the Shang and Xia dynasties, though oracle bones were found from the Shang Dynasty showing the title 王 (wáng, "king"). 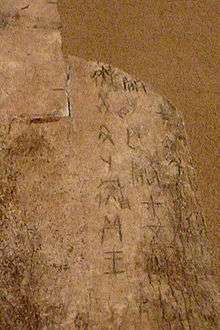 In this Shang Dynasty oracle bone (which is incomplete), a diviner asks the Shang king if there would be misfortune over the next ten days; the king replied that he had consulted the ancestor Xiaojia in a worship ceremony. Notice the title for king, 王 wáng, on the bone. The king (王, wáng) was the Chinese head of state during the Zhou Dynasty. Its use during the Xia and Shang is uncertain but possible: the character has been found upon oracle bones. It was abolished under the Qin and, after that, the same term was used for (and translated as) royal princes. The title was commonly given to members of the Emperor's family and could be inherited. A poem from about 2,500 years ago said "普天之下,莫非王土.率土之賓,莫非王臣" which roughly translates as "Under the sky, nothing isn't the king's land; the people who lead the lands, no one isn't the king's subjects." The Son of Heaven was a title of the Emperor based on the Mandate of Heaven. The Son of Heaven is a universal emperor who rules tianxia comprising "all under heaven". The title was not interpreted literally. The monarch is a mortal chosen by Heaven, not its actual descendant. The title comes from the Mandate of Heaven, created by the monarchs of the Zhou dynasty to justify deposing the Shang dynasty. They declared that Heaven had revoked the mandate from the Shang and given it to the Zhou in retaliation for their corruption and misrule. Heaven bestowed the mandate to whoever was best fit to rule. The title held the emperor responsible for the prosperity and security of his people through the threat of losing the mandate. Unlike the Japanese emperor for example, Chinese political theory allowed for a change of dynasty as imperial families could be replaced. This is based on the concept of "Mandate of Heaven". The theory behind this was that the Chinese emperor acted as the "Son of Heaven". As the only legitimate ruler, his authority extended to "All under heaven" and had neighbors only in a geographical sense. He holds a mandate to which he had a valid claim to rule over (or to lead) everyone else in the world as long as he served the people well. If the ruler became immoral, then rebellion is justified and heaven would take away that mandate and give it to another. This single most important concept legitimized the dynastic cycle or the change of dynasties regardless of social or ethnic background. This principle made it possible for dynasties founded by non-noble families such as Han Dynasty and Ming Dynasty or non-ethnic Han dynasties such as the Mongol-led Yuan Dynasty and Manchu-led Qing Dynasty. It was moral integrity and benevolent leadership that determined the holder of the "Mandate of Heaven." Every dynasty that self-consciously adopted this administrative practice powerfully reinforced this Sinocentric concept throughout the history of imperial China. Historians noted that this was one of the key reasons why imperial China in many ways had the most efficient system of government in ancient times. Finally, it was generally not possible for a woman to succeed to the throne and in the history of China there has only been one reigning Empress, Wu Zetian (624–705 CE) who usurped power under the Tang dynasty. The first character(s) are the name of the dynasty or kingdom. e.g. Hàn, Táng, Wèi and Hòu Hàn. Then come the characters of how the sovereign is commonly called, in most cases the posthumous names or the temple names. e.g. Gāo Zǔ, Tài Zōng, Wǔ Dì, Guāng Wǔ Dì. Then follow the characters of their family and given names. e.g. Liú Bāng, Lǐ Shì Mín, Cáo Cāo, Liú Zhī Yuǎn and Liú Xiù. Emperors of the Ming and Qing dynasties: use era names (reign names) because most emperors had only one distinctive era name during their reign, e.g. the Kangxi Emperor (康熙 kāng xī) of Qing. The exceptions are the first two emperors of the Qing Dynasty, and Emperor Yīngzōng (英宗) of Ming, who had two era names. However, the use of era names makes many mistake these for the names of the emperors themselves, and many scholars therefore encourage a reversed wording for Ming and Qing emperors, e.g., the Kangxi Emperor, the Qianlong Emperor, et cetera. To be more precise, and clear in English, one could use: the Kangxi era Emperor, etc.